Here’s what’s of interest coming out from DC Comics in July. A full list of solicitations is available here. 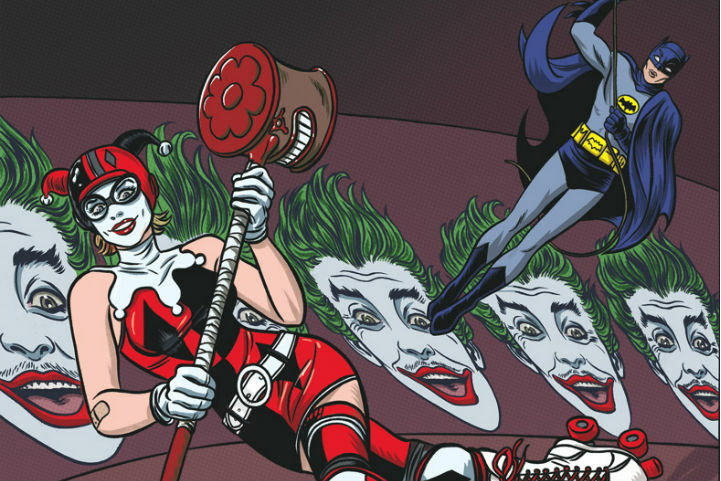 Elsewhere, “Batman ’66” introduces Harley Quinn into the book’s universe, slightly renamed “The Harlequin” and engaged in what looks like deadly…roller derby? This year’s the 75th anniversary of Green Lantern, so Alan, Hal, and (presumably) John are getting the hardcover anniversary special treatment. “Scooby-Doo Team-Up” features a pairing of the gang with, of all characters, Secret Squirrel. It looks like his original 60s version from the artwork, versus the hilarious “Super Secret Secret Squirrel” shorts of the 90s. I gather the series is moving into the full range of Hanna-Barbera characters, including the anthropomorphic animal ones (versus Scooby, who’s “just” a talking animal)? Wonder if we’ll also see Atom Ant, or the various other 70s “mystery solving teens with wacky sidekicks” like Captain Caveman and the Teen Angels?